Currently, the sales volume of restaurants with sushi conveyors (another name — kaiten) in Japan is about 2.2 billion dollars. 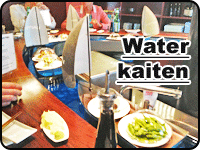 In 2015, there were nearly 2500 kaiten restaurants in the land of the rising sun. 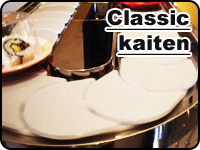 What is more, kaiten in Japan isn't used only for sushi and rolls — sushi conveyors can also move drinks in Tetra Pak packages, fruits, desserts, soups, and other products. In Europe, Australia, USA, and also several countries of the Middle East, sushi conveyors are installed by bars and restaurants with innovative style. They want to stand out from competitors and save on fixed costs. The average bill of a restaurant increases due to direct visual stimulation of clients, a person sees a ready dish, the brain associates what it has seen with the taste and increases appetite. All restaurants try to achieve a similar effect with a bright beautiful menu with photos of dishes. With kaiten conveyor, this effect is much stronger. 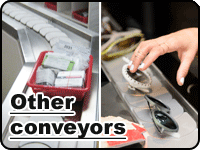 Sushi conveyor is designed for a large number of clients and high customer traffic — it is fundamentally different sale mechanism. The ready dish passes directly in front of the client, and he can choose what to take – it realizes the principle of self-service. 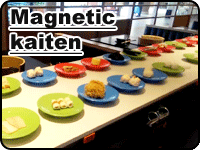 Sushi conveyors have special plates of different colors (depending on the dish cost). 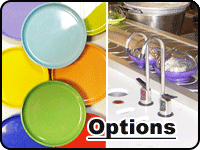 As an option, it is possible to install an electronic system for the order of specific dishes. The client is not limited in the choice. Only the restaurant chain Yo! SUSHI in England has about 50-70 restaurants and cafés with sushi conveyors. In total in Europe and in the Middle East there are about 1000-1200 sushi conveyors. Significant reduction of necessary number of waiters, up to complete refusal of them. The average bill increases by 10-30%. Ready dishes pass by the client — direct motivation to additional orders. Very effective in buffet format. Attracts more clients by non-standard format of restaurant. Buffet format — the client pays once for an entrance and eats unlimited sushi. The price depends on the color of the plate — dishes in the menu are divided into price categories and each category has its own color plates. When calculating the cost of the bill, the sum is determined by the number of plates on the table of the client.